Behind the swinging door to the dining room, the language of the restaurant kitchen is Spanish. At most Long Island restaurants - be they Italian, French, New American or steak house - most of the cooking positions are held by immigrants from Mexico and Central America. But with few exceptions, the position of executive chef is held by someone born either in the United States or in Europe. Even more unusual on Long Island is a fine-dining restaurant owned by a Latin-American immigrant. 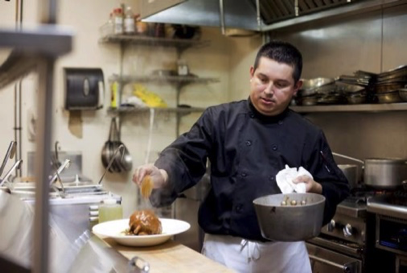 El Salvador-born Elmer Rubio started his restaurant career at age 18 as a dishwasher at Mill River Inn in Oyster Bay. It was 1989. Fourteen years later, in 2003, he opened Chachama Grill, a New American restaurant in East Patchogue. His is a singular story. When he was growing up, Elmer Rubio thought he would be a dentist. In his hometown of Santa Rosa, the 12-year-old Rubio made crowns in a dental lab and thought such a career might suit him. But the country's civil war (fought between 1980 and 1992) prevented him from making it past sixth grade and spurred the family to emigrate to the United States. After a brief stay in Los Angeles, he landed with some cousins in Oyster Bay and took a dish-washing job in the kitchen of Mill River Inn, then run by noted chef Michael Meehan. "After a year, I started working at the salad station," Rubio recalled. "I began to get interested in food. I saw Michael and the other chefs playing with the food, moving it around on the plate to make it look better. My mother never let me play with my food." Michael Meehan was surely a much greater influence on Rubio's cooking than his own mother was. Despite some Latin American flourishes - mashed sweet plantains in his oysters Rubio, pumpkin seeds in the squash bisque - he cooks in a New American idiom. "People look at me and say, 'Why is your restaurant completely different from where you are from?' But, to me, it doesn't matter where I am from. This is what I have learned, and a chef has to know what he is doing." Rubio figured out early on that he would have to perfect his English if he wanted "to go to the next level" and, through language classes and forcing himself to converse in English, he succeeded. He also realized that his culinary education would not be complete without "front-of- the-house" experience. So, for two years at Mill River, he worked two nights a week as a busboy in the dining room. Rubio learned to serve plates from the left, and clear from the right. To pick up a water glass before pouring, so as not to spill water on the table. To put patrons' coats on hangers that correspond to their positions at the table so they could be "magically" returned to the correct person at meal's end. After Mill River, Rubio worked directly under Meehan at Tupelo Honey in Sea Cliff. He also supervised the kitchens at Bookmark Cafe in Oyster Bay and Meritage in Bellport. He was working long hours at a physically punishing job, but what started to get to him was the stress of being second in command. "I was one of the employees but also the representative of the owner," he said. "I had responsibility for the kitchen, but didn't make the decisions." In 2002, Rubio was about to get married and had saved enough money for a down payment on a house. Then he had a dispute with the owner of a restaurant for whom he worked. He and his fiancee, Mary (now his wife), decided to invest the money in a restaurant, instead. Elmer Rubio was now a chef-owner. Rubio doesn't spend a lot of time pondering his career path - he's far too busy - but he has thought about what hinders other talented Spanish-speaking cooks from taking leadership positions. "Some people don't want the responsibility," he said. "And for a lot of immigrants, taking that step means deciding that you want to spend your life here. When I first came to America, I thought I'd be here for three years. I had to commit to staying before I could move ahead." You'll need about 1/2 cup of creamed spinach to make this dish. Frozen, prepared according to package directions, is fine. The fufu and Rubio's own "wua kah tie" sauce can be prepared in advance; fry the oysters just before you plan to serve. 1. Preheat oven to 250 degrees and bake plantain until soft, about 45 minutes. (A plantain is ripe when its skin color is anywhere from yellow to almost black.) 2. Film the bottom of a skillet with oil, then add bacon, scallions, cilantro and garlic clove. Saute over medium heat until bacon is crisp and scallions are soft. Remove garlic clove. Place in a food processor with sour cream and process until smooth. Taste for salt and pepper. Set aside. Film the bottom of a skillet with canola oil. Add shallot and saute over medium heat until soft. Add garlic, pumpkin seeds, red pepper and cilantro and saute until garlic begins to color and red pepper softens. Put in food processor with the flesh of the avocado, the sour cream and wasabi. Puree. Taste for salt and pepper. Set aside. Season cornmeal with salt and pepper. In a deep fryer or heavy, deep pot, heat canola oil to 350 degrees. Dredge oysters in cornmeal and deep fry, in 2 batches, until golden brown, about a minute and a half. Arrange oyster shells on 2 plates. On top of each shell, place a spoonful of fufu, a spoonful of spinach and a fried oyster, then top with some wua kah tie sauce. Makes 2 servings. The Salvadoran-born all-star chef at Chachama Grill in East Patchogue, cooked his way to the top in a new American dream.